The experience of the First World War made it clear that in any future war naval vessels not only had to fear enemy surface ships, submarines and mines but also torpedoes and bombs dropped by aircraft. As with any radically new problem this took some time to become accepted but the steady improvement in aircraft speed, range and load-carrying performance in the interwar period eventually prompted navies around the world to devise and fit various forms of specialised anti-aircraft guns. For long-range fire the preferred approach was for dual-purpose weapons of between 4in and 5.25in calibre (102-133mm) on high-angle mountings. The Royal Navy's various efforts to produce these were not always successful, largely because of an over-emphasis on the surface fire role (see "Medium Calibre Guns of the RN in WW2" on this website). In addition, the need to provide a second and even a third layer of defence against aircraft pressing home their attacks was realised. This invariably took the form of rapid-firing machine guns for the short-range role and cannon of calibres up to 40mm (about 1.6in) for medium ranges. Today, such guns are known as close-in weapon systems, or CIWS. In deciding the appropriate weapons to be fitted, there were (and still are) various considerations apart from the obvious ones of cost and availability. The range and hitting power of the guns, the weight of the mountings and the problem of locating them to provide the maximum field of fire (sky arcs) without blowing holes in the superstructure were basic concerns. Perhaps less evident were questions of power requirements (powered mountings offered much faster training and elevation rates but were more expensive and vulnerable to loss of power through action damage), the crew required to man them (warships were commonly overcrowded in wartime) and the maintainability of the equipment (simplicity and reliability became highly valued). The method of aiming was also a factor; lightweight small-calibre guns generally used open sights so their accuracy was greatly dependent on the gunner's skill. Larger mountings commonly featured director control, which added to the mounting and manning demands. During the early 1930's the RN selected two weapons to fulfil these roles; the .5in (12.7 mm) Vickers heavy machine gun and the 2 pounder (2pdr) of 40 mm calibre. Both guns used scaled-up versions of the Vickers-Maxim machine gun mechanism, the basic design of which originated in the 19th Century. Wartime experience revealed various inadequacies in both weapons, leading to their partial replacement by the 20mm Oerlikon and the 40mm Bofors. The .5in Vickers was a medium-power heavy machine gun originally intended to be used by all three services. It fired a 38 gram bullet at a muzzle velocity of 770 metres per second (m/sec) and at a rate of 700 rounds per minute (rpm). The Army did make limited use of it, but almost exclusively as the main armament of certain small tanks and armoured cars and it soon became superseded. The Royal Air Force tested it but decided to stay with the .303in (7.7mm) calibre (a decision they may later have had cause to regret). The naval application of the gun initially appeared in the early 1930's in a four-barrel mounting (shown below) weighing between 1,000 and 1,300 kg and intended mainly for destroyers. Unusually, the four barrels were vertically stacked. Subsequently, twin and single-barrel versions were produced for smaller craft. All of these were unpowered except for the hydraulic Mk V twin, which had a very respectable training and elevation rates of 72 and 50 degrees per second respectively. This weighed about 500kg and was typically fitted to fast patrol boats. War experience soon exposed the .5 in cartridge's lack of range and hitting power. The high rate of fire meant that it was effective against strafing aircraft which came too close but it was of little use against torpedo and dive bombers. The Navy clearly had some inkling of this even in the mid-1930's because a vastly more powerful machine gun was developed by Vickers between 1935 and 1938. This was the .661 in (16.8 mm) which fired an 85 gm bullet at about 1,000 m/sec at a rate of 300 rpm and was intended to be fitted in a six-barrel mounting. In the event, development was cancelled in 1938, apparently because the cartridge did not fire an explosive projectile; the mounting was also complex and very heavy. The gun which eventually replaced the .5 in was of course the seemingly immortal 20 mm Oerlikon. This did not boast a particularly dramatic performance, firing a 122 gm projectile (normally explosive) at 830 m/sec and at a rate of about 450 rpm. The 60-round ammunition drum allowed only 7.5 seconds firing before reloading. While the gun had a theoretical maximum range of 4.4 km, the practical maximum was only about 1.5 km. However, its advantages were great simplicity, ruggedness and reliability. Most mountings had no power requirements and thus could be sited wherever there was space. The most common mounting was the Mk II single, which weighed between 500 and 750 kg. The hydraulically powered Mk V twin weighed 1,200 kg, but later manual twin mountings weighed less than 600 kg. A complex, four-barrel belt-fed mount was developed but not adopted. The Oerlikon was always best suited to the simple manual mount, as was emphasised by the later conversion of Mk Vs to take a single Bofors gun instead. Many other machine guns and light cannon were pressed into service, particularly in Defensively Equipped Merchant Ships (DEMS). The RAF's 20 mm Hispano cannon saw limited use. Its superior performance (a muzzle velocity of 880 m/sec and a rate of fire of 600 rpm) and lighter weight did not compensate for its relative fragility. Incidentally, although Hispano cartridges were about the same size as those used in the Oerlikon they were not interchangeable. The American .50 in Browning saw some use; this fired a larger and more powerful cartridge than Vickers. Finally, there were many and various light rifle-calibre machine guns of more morale-boosting than practical effect. It was both amazing and depressing to see such weapons still being pressed into anti-aircraft service in 1982 in the Falklands! The 2pdr was at the end of a venerable line of development stemming from the original 37 mm 1pr "pom-pom" used in the Boer War. It was introduced during the First World War specifically for the anti-aircraft role. It fired explosive shells weighing around 0.9 kg (just under two pounds) at a rate of 90 rpm. Muzzle velocity was initially only 620 m/sec. 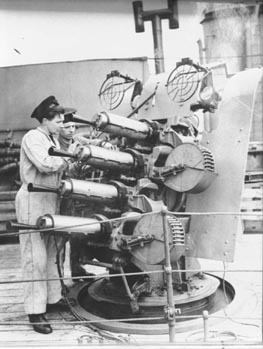 The 2pdr was planned to be fitted in two mountings; an eight-barrel mounting (shown below) weighing around 16,000 kg which was intended to arm battleships and aircraft carriers (first fitted to Warspite, Rodney and Nelson in the late 1930's) and a four-barrel version which first emerged in County class cruisers and Tribal class destroyers. Initial Marks of this were manual and weighed 8,700 kg; later powered Marks weighed 10-11,000 kg. Single barrel mountings weighing 1,400-1,800 kg appeared later and were used in a wide variety of vessels including fast patrol boats. The size and weight of the four and eight barrel mountings is emphasised by comparison with typical medium-calibre equipment; a single 4 in (102 mm) weighed about 5,000 kg, a twin 4 in 15,000 kg, and a single 4.7 in destroyer mounting (120 mm) around 9,000 kg. The theory was that the multiple "pom-pom" 2pdr would put up a barrage of explosive shells which any attacking aircraft would be unlikely to survive. The mountings would be controlled by director fire and a high muzzle velocity was not at first felt to be important. Later on, the low velocity was recognised as a disadvantage and a more powerful loading was introduced which raised the muzzle velocity of 730 m/sec (at the cost of a reduction in shell weight to 0.76 kg). This could only be fired in modified guns and the unusually "hot" high-pressure loading cannot have done much for the reliability. At the same time, the rate of fire was raised to 115 rpm. Following the loss of the Prince of Wales and the Repulse, an analysis of the anti-aircraft fire by the Gunnery Officer of the Prince of Wales revealed that the 2pdrs suffered frequent stoppages due to the separation of the shell from the cartridge case. Furthermore, they were not firing tracer ammunition and thus had no deterrent effect. By contrast, the single 40 mm Bofors gun was very reliable and the tracer ammunition from this (and even the Oerlikons) was seen to disturb the approach of the Japanese aircraft. The recommendation was strongly in favour of fitting Bofors guns in the future. Even before the war broke out, some work was done on a replacement in the form of a 1.5pdr with a muzzle velocity of 800 m/sec but this was abandoned when the eight-barrel mounting was found to weigh even more than the 2pdr's. Its ultimate replacement was of course the 40 mm Bofors but the 2pdr remained in service throughout the war and for some years after. In particular, it experienced a minor revival in the Far East in 1945 in single barrel form as a replacement for twin Oerlikon mountings, as the heavy shell was more effective against kamikaze attacks. This brings us to the 40 mm Bofors which appears to be sharing the Oerlikon's immortality. In comparison with the 2pdr, the Bofors fired a 0.9 kg shell at a higher muzzle velocity of 880 m/sec and at a faster rate of 120-150 rpm. It thus had a significantly longer effective range (about 3 km instead of 2 km, although the maximum range of both guns was about three times further). Most important of all, it was light, simple and reliable. The Bofors had a curious introduction to naval service as it was originally adopted by the Army (a fortunate change of mind; the 2pdr was initially selected instead). Its obvious qualities led to its adoption by the Navy in 1941, the first ships equipped being the Prince of Wales, Nelson, Manchester and Erebus. These guns, and many others fitted to warships, were of the air-cooled Army pattern only slightly modified for Naval use and the single mountings weighed between 1,200 and 1,400 kg; about the same as the 2pdr. The air cooling obviously limited the continuous rate of fire (the 2pdr, and even the 5 in Vickers, were almost invariably water--cooled although the Oerlikon was not). The Navy therefore adopted the twin-barrelled water-cooled Hazemeyer mounting of Dutch origin (shown below), the first RN vessel so equipped being the Whimbrel in November 1942. This was a complex mounting, triaxially stabilised so that the guns would (at least in theory) be held on target regardless of ship movement, but it weighed over 7,000 kg and was not noted for reliability. Towards the end of the war the simpler and lighter (6.500 kg) Mk V twin mounting was developed instead and this became the standard postwar twin mounting. Water-cooled Bofors guns were also supplied from the USA in both twin and quadruple mountings, weighing about 6,000 and 11,000 kg respectively. Finally, mention must be made of two British mountings which did not see service until after the War; the six-barrel Mk VI, fitted in Vanguard, which weighed nearly 22,000 kg, and the awesome 15,000 kg twin STAAG, a sort of "Super Hazemeyer" with its own on-mount radar. The theoretical performance of this mounting did not compensate for its weight and complexity and it did not long survive. The success stories in close-range anti-aircraft guns in World War Two were undoubtedly the single-barrel, unpowered 20 mm Oerlikon and the 40 mm Bofors, particularly in its single-barrel air-cooled form. Both guns combined an adequate ballistic performance with simplicity, reliability, light weight and minimal "ship impact"; they could be sited almost anywhere, and frequently were! The success of these weapons was not limited to the Royal Navy. The US Navy commenced the war with two weapons of this type; the .50 in Browning and the 1.1 in (28 mm), but soon came to prefer the Oerlikon and the Bofors. The German Navy also made use of these guns along with various others of domestic manufacture. In the end, the surest measure of success is their amazing longevity. Both Oerlikon and Bofors remained in RN service into the 1990s, over 50 years after their initial appearance. It is worth noting that the RN were looking for something even better than the Bofors later in World War 2. 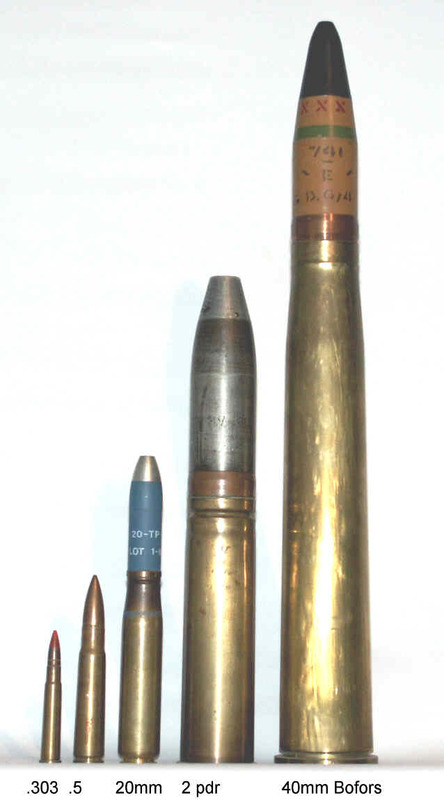 Examples exist of 1944-dated 40 mm ammunition designated 2pr 75cal (40x277RB) which fired its 900 g projectile at 914 m/s. The case design suggests that the gun, given to BSA to develop, would have used a similar operating system to the Oerlikon, but it is probable that a gun was never built. The aftermath of the Second World War was a period of great confusion in military technology. Wartime experience had proved (or disproved) the value of many weapon systems, to use a modern term, together with the tactics to make the best use of them. The very end of the war, however, saw the introduction of dramatic new developments which threatened to reduce to obsolescence much of the equipment and experience built up at such cost. The most dramatic of these was of course the atomic bomb. At a lower level of destruction, the introduction of ballistic missiles (V2) and jet aircraft were also significant. For the Royal Navy the most influential newcomers were the fast new German submarines, followed in importance by guided missiles; both the anti-ship versions deployed by Germany and particularly the anti-aircraft missiles which were just becoming technically feasible. For several years after the war, the emphasis in anti-aircraft defence was on improved guns and director systems. Much time and money was spent in developing fast--firing high-velocity automatic cannon in a variety of calibres, intended to make the best use of the new "VT" or proximity fuze. The most successful of these was the twin 3in (76mm) mounting which only saw RN service in the Blake, Lion and Tiger, although it was also fitted as the main gun armament in nine Canadian frigates. Incidentally, an American version using the same ammunition was developed in parallel but was less reliable and did not long survive. The gun performance was similar to that of the later and far more successful Italian 76mm OTO Melara, but the main difference was that the Italian gun was developed from the start in a single, compact mounting a small fraction of the weight of the British equipment. For the close range role the RN explored various options under the general "D.A.C.R." heading (Direct Action, Close Range). The proposed calibre of these systems varied, with early references to a 34 mm system (which may have been designed around the high-velocity Vickers Class T 34 mm round) and with the final mention, in the late 1950s, being a 57 mm twin mounting. However, most attention was given to the new, high performance 40 mm L/70 Bofors gun. This was adopted by the British Army but the RN never acquired it, presumably because of budget restrictions and the availability of vast numbers of war-surplus older versions of the Bofors. By the late 1950's, interest had switched to guided missiles. The relative advantages and disadvantages of gun and missile air defence systems is a complex issue, the balance of which shifts from time to time depending on technological developments both in the systems themselves and in the threats with which they have to cope. The major advantage held by missiles (at least up to the present) is that they can be steered all the way to the target. By contrast, the hit probability of a shell from a gun decreases very rapidly with increasing distance, partly because of aiming errors or other ballistic influences (winds, barrel wear, variation in muzzle velocity) and partly because aircraft if not necessarily missiles can manoeuvre. On the other hand, guns have their own advantages. 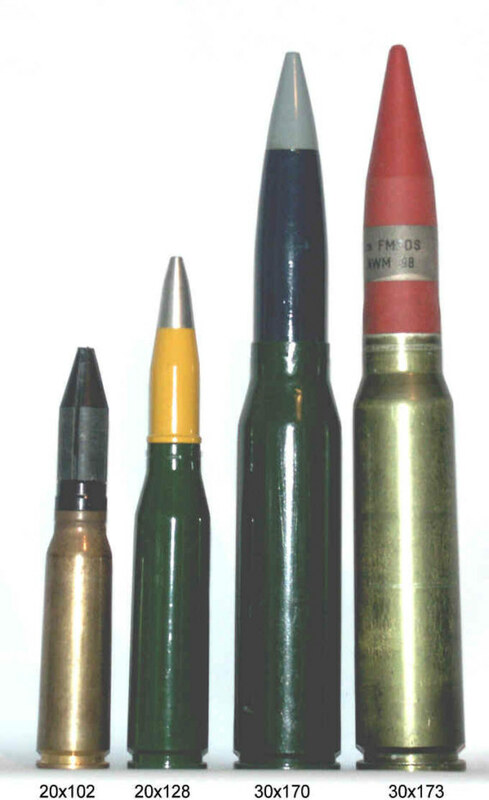 Ammunition is small and cheap, can be stored in great quantity and fired at a high rate, making up to some extent for the system's inherent inaccuracy. Their minimum range is virtually zero, whereas all current AA missiles (except small, man-portable systems) take time to come under full control after launching and thus have a minimum range which can be as much as 1 km. On balance, missiles can be said to be clearly more effective at ranges of 5 km or more, guns preferable for ranges of under 2km, with a grey area in between. All but the most specialised close-in weapon systems (CIWS) are also more versatile. 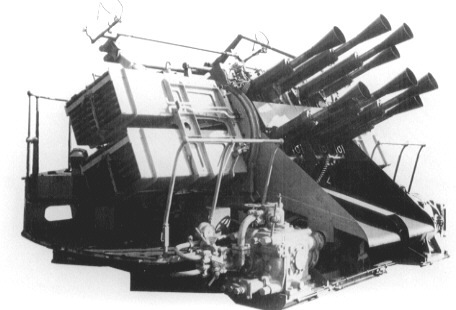 They can be fired against small surface vessels and even land targets as well as aircraft, and can also fire warning shots in a display of determination; hardly economic, even if feasible, with missiles, It was this final factor which really preserved the Oerlikon and Bofors guns after the widespread introduction of the short-range Seacat missiles. Modern warships sent to deal with terrorist insurrections in the Far East, a job which involved much stopping and searching of small vessels, found the 4.5 in (114 mm) gun a singularly inappropriate weapon! The Seacat missile was the first introduced in 1962 as a Bofors replacement. As with the Bofors, its main advantages were simplicity, compactness, reliability and low cost, so it sold widely abroad, However, it was an unsophisticated system incapable of dealing with the threat of the high-performance Russian anti-ship missiles which began to appear in the 1960's. Accordingly, a more sophisticated system, Seawolf, was developed from the mid-1960's, eventually entering service in 1979. This is unquestionably effective, but the whole system is bulky, complex and expensive and no export sales were obtained. The RN was well satisfied with its performance and has only recently developed a replacement in the form of the Sea Ceptor system, which is expected to enter service in 2016 and is already gaining export sales. In at least one sense the RN was fortunate that its first "shooting war" of the missile era was relatively limited conflict rather than the all-out North Atlantic battle against the Warsaw Pact which had increasingly become its rationale. Soviet anti-shipping tactics called for the simultaneous release of dozens of large, high performance missiles, launched by aircraft, submarines and surface ships, against any worthwhile naval concentration. Considering the havoc cause around the Falklands by a handful of the relatively small Exocets, launched individually, the fate of an RN task force assailed at that time by a major Soviet-type onslaught does not bear thinking about. As it was, the major threat came from aircraft dropping bombs at close range, essentially no different from a Second World War attack except for the higher performance of the aircraft. The old lesson was rapidly relearned; there is no such thing as too much AA armament! While Seawolf in particular proved itself highly effective considering it was only present in the two Type 22 frigates Brilliant and Broadsword, the lack of modern short-range AA guns was keenly felt. In the aftermath of the conflict, urgent steps were taken to remedy the deficit. A missile system as complex as Seawolf cannot simply be bolted onto an existing ship, but small-calibre guns can, and have been. The rapid acquisition of a range of gun CIWS during and after 1982 had all the appearance of an act of panic! While there was no doubt a strong feeling of urgency, and the speed with which the MoD's normal procurement process was short-circuited was admirable, the purchases were sensible and practical. They were of two quite different types, to meet two very different threats. The most spectacular threat was that of the anti-shipping missile, specifically Exocet. It now seems quite incredible that pre-Seawolf RN ships were so poorly defended against this type of attack, apart from passive decoys, when it had long been known to be possessed by many small navies as well as being the main weapon of the Russian Navy. Manually-aimed systems, whether guns or missiles, are quite useless against such devices. Some form of fully-automatic system, able to detect, aim and fire within seconds, without human intervention and with precise accuracy, is essential. Seawolf fulfils that role admirably for ships fortunate enough to be so equipped, but in 1982 the only proven alternative was an American gun system, Phalanx, nine of which were promptly ordered to equip the Invincible class carriers and provide some training. Phalanx is based around a very sophisticated radar and fire control computer, which is capable not only of tracking incoming missiles and firing the gun as soon as it is in range, but of detecting and computing the course of its own bullets and correcting the aim accordingly (a "closed loop" system). The gun used is the six-barrelled 20 mm M61 Vulcan cannon firing 20x102 ammunition and originally designed for equipping fighter aircraft. In that form, it is capable of firing at an astonishing 6,000 rounds per minute, although it is derated to 3,000 rpm for the Phalanx application (increased to 4,500 rpm in later versions; the current Phalanx Mod 1B also has an improved ballistic performance and the ability to engage surface targets). Another difference is the type of ammunition; in common with other anti-missile guns Phalanx does not fire the usual full-calibre explosive shells but instead APDS (armour-piercing discarding sabot) rounds, small solid high velocity (1,100 m/sec) bullets of 12.5 mm calibre contained in a light sleeve which falls away as it leaves the muzzle. The reason for this choice of projectile (which is actually less effective against aircraft) is that while larger guns and AA missiles can knock down anti-ship missiles at a distance by blowing away their wings and controls with proximity-fuzed explosive warheads, once the missiles get within 6-700 metres of the ship, their ballistic momentum is likely to carry them to the target even if they are damaged. Phalanx bullets are therefore intended to penetrate and explode the missile's warhead. Even so, a typical 200 kg RDX warhead has to be exploded at least 150 metres from the ship to avoid blast damage. The Phalanx mounting weighs about 6,000 kg and contains ammunition for nearly 20 seconds firing; this is enough for several engagements as the gun fires in short bursts. The maximum range is about 1.5 km. A significant advantage of the mount is that it requires no deck penetration and thus can be bolted in any convenient location, topweight considerations permitting. A more powerful anti-missile CIWS operating on similar principles to Phalanx is the Dutch Goalkeeper system which the RN ordered in 1984 to supplement and partially replace Phalanx. This is based on the much more potent 30 mm GAU-8/A rotary cannon, also developed for aircraft use, which fires at the higher rate of 4,200 rpm. The maximum range is 3 km, although fire is normally opened at a closer range to avoid wasting ammunition, of which some 15 seconds worth is held on the mounting. It has considerably more "ship impact" than Phalanx, as the mounting penetrates two decks, and thus cannot easily be retrofitted to smaller vessels. Fifteen Goalkeeper systems were ordered, three each for Invincible, Illustrious and Ark Royal, one of each of the Batch 3 Type 22 frigates (Cumberland, Campbeltown, Chatham and Cornwall) and two for training. The Phalanx units displaced from the lnvincibles were fitted to the Type 42 destroyers Birmingham, Glasgow, Exeter and Southampton. However, as the RN ships which carried it have gradually left service the number of Goalkeeper systems has declined, and in 2014 there were only a couple left, planned to last for another couple of years. In contrast, the Phalanx systems (about 30 of which are in service) have been retained and updated. As has already been recounted, the Falklands War not only demonstrated the effectiveness of modern anti-ship missiles but also the shortage of weapons to repel conventional air attacks. The RN therefore took prompt steps to acquire additional anti-aircraft cannon. The smallest of these was the 20 mm Oerlikon GAM-BO1, a direct modern replacement for the World War Two 20mm and made by Astra of Grantham, formerly BMARC, an Oerlikon subsidiary. The 20 x 128 KAA cartridge is much larger and the performance much superior, with a muzzle velocity of about 1,100 rn/sec. a projectile weight of 125 gm and a rate of fire of 1,000 rpm. The muzzle energy is some 60% higher than that of the old 20 mm and this is in conjunction with the doubled rate of fire greatly increases the effectiveness. The maximum range is 6.8 km although the effective range is about 1.5 km against aircraft and 2 km against surface targets. The single, unpowered mounting weighs about 500 kg and was fitted to all Type 42 destroyers, the Invincible class, Intrepid and Brazen. It now mainly survives on auxiliary vessels for protection against pirate attacks. The second gun selected was the 30 mm Oerlikon KCB (also made by Astra/BMARC) which is considerably more powerful than the 20 mm. The muzzle velocity is about the same but the 360 gm shell has three times the muzzle energy, giving an effective range of about 2.5 km. Rate of fire is lower at 650 rpm. Although of almost identical size and power, the 30x170 ammunition is not interchangeable with the 30x173 type used in Goalkeeper. The KCB cannon was ordered in two mountings; twin and single barrel. The twin (GCM-A03) was fully-stabilised with a self-contained power supply. It weighed just over 2,500kg and two mountings were fitted to Bristol and all Type 42s (although subsequently replaced in some by Phalanx) but has been out of service for some years. The single-barrelled mounting (DS30B) has a simpler type of stabilisation, weighs 1,200kg and was ordered in quantity to replace the remaining 40 mm Bofors, fitted to the 'Hunt', Sandown and Type 23 classes. All of these mountings rely on manual guidance and therefore on the skill of the gunner, although the sighting aids are admittedly of much higher quality than those available in World War II. The DS30B is now being replaced by the DS30M Mark 2, which differs in two major respects: it is remotely controlled by a gunner within the vessel who aims with the aid of a TV screen (with night vision) and a joystick, and the Oerlikon gun has been replaced by the ATK MK44 "Chain Gun". This fires the same basic 30x173 ammunition as the Goalkeeper at a relatively low rate of only about 200 rpm, emphasising the fact that the intended targets are small surface craft and helipters, not fast jets. The DS30M Mark 2 is also known as the ASCG (Automated Small Calibre Gun) and is made by MSI Defence Systems. It is in the process of becoming the standard light gun system of the RN and will be widely used. Following the Falklands War, the Royal Navy suffered from having to fit new weapon systems to ships which were not designed to carry them and which in many cases already had no stability reserve to cope with the additional topweight. This greatly limited the choice of equipment. The result was a very curious mixture of levels of sophistication. At the top of the tree came the Batch 3 Type 22s which with both Seawolf and Goalkeeper must have had the most effective anti-missile defences of any ship in their class. Older Type 22s and Type 23s, with Seawolf but only manually-aimed CIWS, were reasonably well protected. The Invincible class carriers were reasonably well protected by Goalkeeper, as were some of the older Type 42s by Phalanx. The rest of the fleet was terribly vulnerable, not just to missiles but also to conventional air attack. What is clearly missing from the RN inventory is a radar directed automatic cannon of the type commonly fitted to West European warships. For example, the Bofors 57mm Mk 2 weighs 6,000kg (the same as Phalanx; although admittedly the radar and fire control systems will be extra) and fires at 230 rpm, with a practical AA range of 5km. It is claimed to be effective against sea-skimming anti-ship missiles but has the additional advantage of being highly effective against small surface vessels such as fast patrol boats at ranges of up to 16 km. On balance, this flexibility has to make the Bofors very useful, especially if backed up by a Phalanx-type CIWS. It is significant that as well as arming fast patrol boats, the Bofors was selected by Canada as the main gun armament of the Halifax class frigates, has since been ordered by the USN for its Littoral Combat Ships and is also used in the new, large US Coast Guard ships. The principal rival to the Bofors, the 76 mm OTO Melara, has recently had its capability greatly extended by the development of the STRALES anti-missile system, firing DART guided ammunition. The Falklands War was instructive in many ways. In particular, it demonstrated the folly of designing and equipping armed forces to fight a particular type of war to the exclusion of others. This message was subsequently driven home by the astonishingly rapid collapse of the threat from the Warsaw Pact. It may well be that the Falklands actually represents the "hottest" type of war in which the RN is likely to be involved in the foreseeable future, rather than the irrelevant sideshow which some seemed to feel at the time. Most actions could well be against the forces of unstable lesser nations, equipped with missile boats and jet aircraft and possibly launching sudden attacks without warning. In the future, as in the past, the Navy might be required to do almost anything, almost anywhere, and should be equipped accordingly. The "Bible" for all information about Second World War Naval equipment is John Campbell's magnificent "Naval Weapons of World War Two". Mention should also be made of "Destroyer Weapons of World War 2" by Peter Hodges and Norman Friedman, "Battleship" by Martin Middlebrook and Patrick Mahoney (which contains the report of the Gunnery Officer of the Prince of Wales) and four articles by Leo Marriott which have appeared in Warship World; "20mm Anti Aircraft guns" (Autumn 1985), "Phalanx" (Autumn 1987), "Goalkeeper CIWS" (Winter 1988) and "30mm guns" (Autumn 1989). "The Postwar Naval Revolution" by Norman Friedman gives a detailed account of postwar naval construction plans and the impact of the new missiles on ship design.